Maple burl has a lot of variety in pattern and color, from dense knots to curls and wavy streaks, from straw blonde, to very dark brown, with hues of red, pink, and gray. Wood has been vacuum stabilized with Cactus Juice. Stabilized wood is easy to polish and highly resistant to chipping, cracking, and blow out while drilling, sanding, or turning. It does not swell or shrink from changes in ambient humidity or temperature. 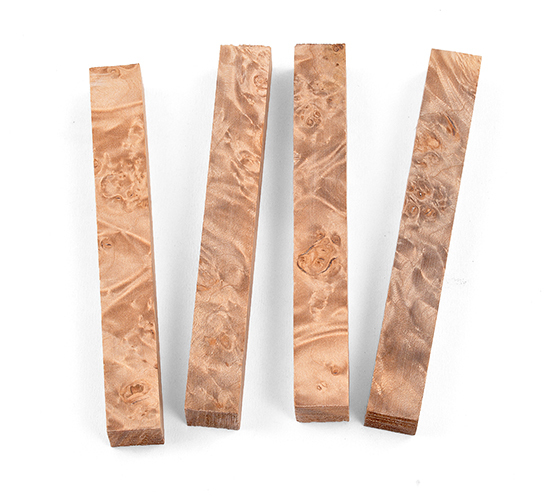 Pen blank dimensions are approximately 5" x 3/4" x 3/4"
Image illustrates variation in grain pattern. Item sold is ONE pen blank. Rod - Nickel/Silver 3/32" dia. x 12"
Rod - Nickel/Silver 1/16" dia. x 12"